We've selected 10 popular projects from Dezeen's Pinterest boards that show how lightwells can be used to channel daylight down into parts of the home where windows are limited. To breathe fresh air into this historic Brooklyn townhouse, New York studio O'Neill McVoy Architects carved out large skylights that funnel natural light in via a small indoor courtyard. To prevent this skinny Vietnamese townhouse from feeling cramped, Kientruc O designed a lightwell that spans its entire length, wrapped by curving, plant-filled balconies on each of the building's four floors. Amin Taha Architects revamped a 1950s terraced house in London by arranging rooms around a light-filled courtyard garden and adding an open-plan basement level. This modest brick residence by Coffey Architects is named after its secluded location, but large skylights cut in a chequerboard pattern ensure the home remains brightly lit. The walls and ceiling of this concrete house in Ho Chi Minh City by VACO Design are perforated, thanks to a series of hollow blocks. They provide ventilation, flood an indoor swimming pool with natural daylight, and cast geometric shadows. Pasel Kuenzel came up with novel ideas to fill this Dutch home with light, including a large central atrium and a gravel-filled courtyard with sliding glass doors. A central lightwell serves daylight to the bathroom, kitchen and storage rooms of this renovated Barcelona apartment by Nook Architects, which also features restored tiles and glass partitions. Nuno Melo Sousa built a single-storey extension in the former courtyard of this Portuguese house, using a glazed wall and a shingle-covered triangular lightwell to visually connect it with the terrace. 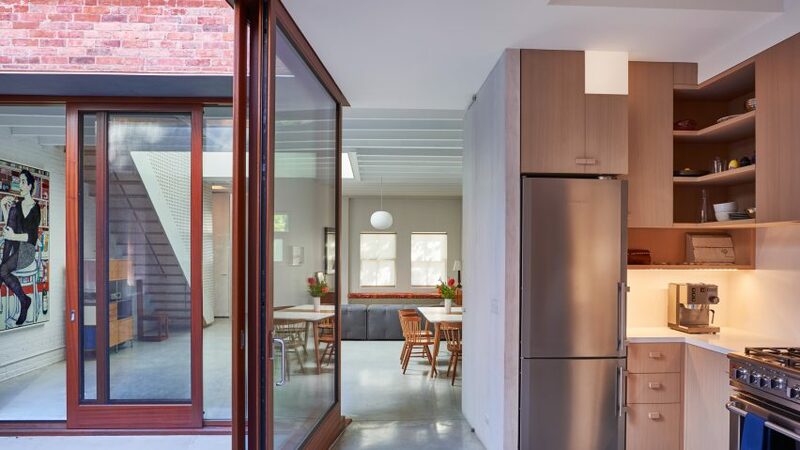 A lightwell separating this house in Sydney from its new extension allows the space to "breathe" according to Welsh + Major. It is topped with a retractable glazed roof so residents can adjust it themselves. To the street, this Tokyo house has an almost windowless facade. But its interiors are flooded with light thanks to triangular voids cut into the building's corners.